In honor of my mom’s birthday yesterday (Happy Birthday Mom! 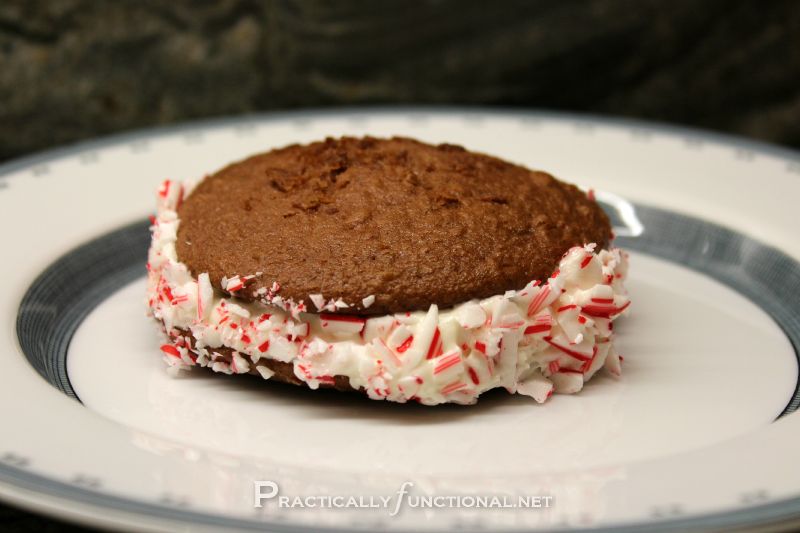 ), I’m going to share a super fun holiday dessert she and I made a few weeks ago: Peppermint Whoopie Pies! Aren’t they pretty?! And they’re as delicious as they look! The cookies only take about 10 minutes to cook, but they have to cool completely before you can turn them into whoopie pies, so make sure you leave yourself a few hours to make these. Start by preheating your oven to 400 degrees F.
Pull out the cream cheese and butter just before you put the cookies in the oven so that they can start to soften. Bake the cookies at 400 degrees F for 8 to 10 minutes. You can use the toothpick test to know when they are done. Over-done is better than under-done, so if you’re not sure, give them another minute or two. 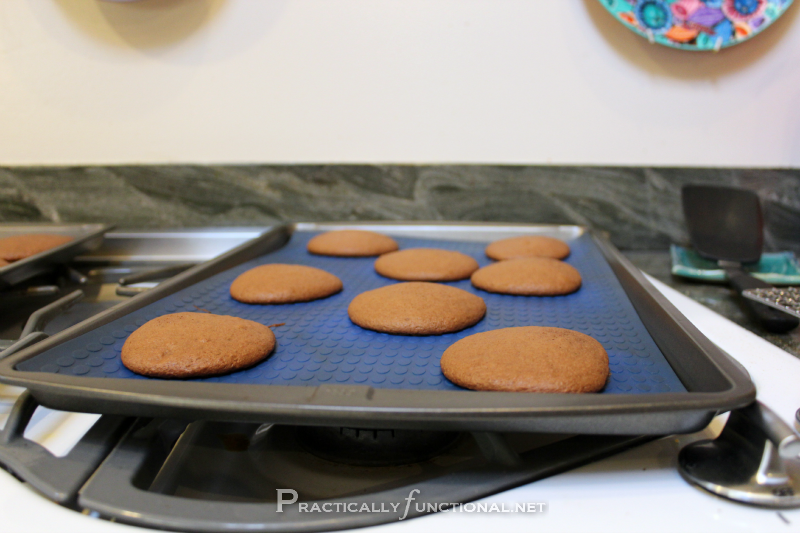 Pull the cookies off the pan and let them cool completely on a wire rack. Once the cookies are cool, mix up the filling. Combine all of the ingredients in a bowl (except the crushed peppermints). Spread the filling on the “back” of one cookie, then stick the “back” of another cookie on top. Make sure to use enough filling that it goes all the way up to the edges of the cookie, but not so much that it gets goopy and falls over the edges. Now enjoy your peppermint whoopie pies! 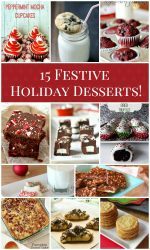 What are your favorite holiday desserts? Have you ever had peppermint whoopie pies (or any other flavor) before? My mom has a few other whoopie pie recipes and they’re all delicious!!! These delicious whoopie pies are the perfect holiday dessert! Pour all the ingredients for the cookies into a bowl and beat for 1-2 minutes. 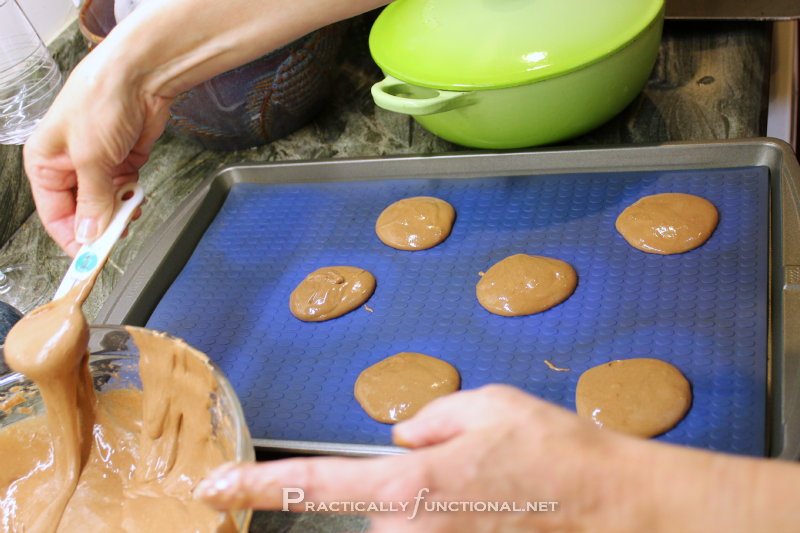 Use a tablespoon to drop small circles of mix onto a cookie sheet lined with parchment paper. Bake the cookies at 400 degrees F for 8 to 10 minutes. Once the cookies are cool, combine all of the filling ingredients in a bowl (except the crushed peppermints). Spread the filling on the "back" of one cookie, then stick the "back" of another cookie on top. 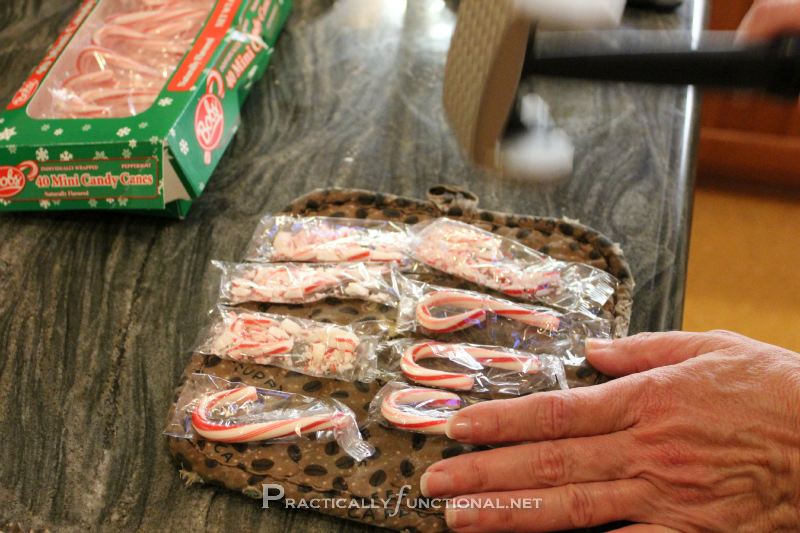 Crush up a bunch of peppermints or candy canes and pour them into a shallow bowl. Roll the edges of the pies over them and the peppermint will stick to the filling, making the edges look pretty. I like this, I would like it more if they were here, now, ready to be eaten. Lol! These cookies are looking too good! These look so pretty! 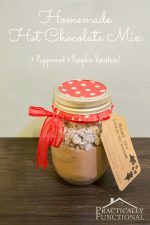 and my grandchildren love peppermint bark, so I’m sure they’d love these. Thanks! 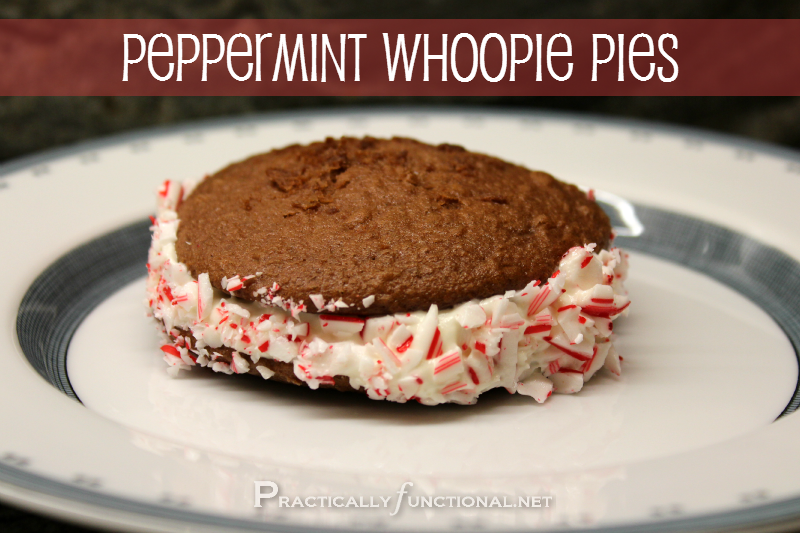 Whoopie pies are one of my favs and I love the peppermint candy addition! Yum! Love the crushed candy cane around the edge! Looks yummy. I love peppermint everything. Link up anytime to I Made It! Monday. This looks good!! Thanks for linking up at Romance on a dime! Oh your whoopie pies look AMAZING!!!! Wow!!! 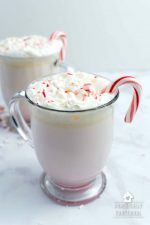 The peppermint sounds really good! These look delicious! 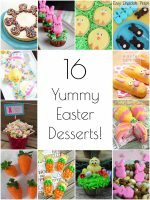 I’m pinning them for next year’s goodies! Happy New Year! Yum! 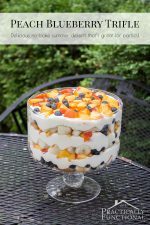 My husband happened to look at the screen and he made sure I pinned this recipe haha! Thanks for linking up! Thanks so much for sharing at Wednesday’s Adorned From Above Blog Hop. Today’s party is live. Here is the link.